Table of Contents Next: Rockey, Keller E.
Rockets are free-flying vehicles propelled by a high-velocity jet of gas. According to Newton's Third Law of Motion (conservation of momentum), the force pushing the jet of gas to the rear of the rocket must be matched by an equal force pushing the rocket forward. In this respect, rockets are not fundamentally different from conventional aircraft. Aircraft are driven by a propeller or jet engine that produces a flow of the surrounding air to the rear of the aircraft, driving the aircraft forward. The gas or air flowing to the rear of the vehicle is known as the reaction mass. Rockets differ from aircraft in being self-contained. The gas jet driving a rocket consists of the reaction products from the rapid combustion of a mixture of fuel and oxidizer that are both stored within the rocket itself. Rockets are also relatively simple and are capable of much faster acceleration than propellers or jet engines of comparable size. On the other hand, a rocket is much less efficient, and thus has a much shorter range, than a conventional aircraft of the same size. The rocket must carry both its fuel and oxidizer, which constitute the sole reaction mass. A conventional aircraft uses the surrounding air as oxidizer and reaction mass. Rockets are not a modern invention. They have been used for entertainment in China for centuries, and the British experimented with rockets as weapons in the late 18th century, with little success. Because of the low efficiency of rockets, they were unable to carry a large enough warhead to have much effect on a military target. Interest in rockets revived between the world wars, when researchers like Goddard in the United States and Tsiolkovsky in the Soviet Union revisited the technology with space travel in mind. Because they are self-contained, rockets are suitable for travel in the vacuum of space. However, rockets were also revisited as potential military weapons because of their simplicity and rapid acceleration. In addition, because a rocket contains its own reaction mass, it imparts no recoil to its launch mechanism, unlike a bullet or shell from a conventional gun. Rockets are broadly classified by whether they use solid or liquid fuel. Liquid fuel rockets generally store the fuel and oxidizer in separate tanks and the two are mixed in the rocket nozzle. This requires a more complex arrangement than solid fuel, and most liquid oxidizers are difficult and dangerous to handle. As a result, no liquid-fuel rocket was used in the Pacific War. Solid-fuel rockets use gunpowder-like mixtures where the the oxidizer and fuel are already mixed; this makes for a very simple rocket that is much safer to handle.The chief drawbacks of solid-fuel rockets is that solid fuels are less efficient than liquid fuels and there is no easy way to shut down the reaction once the fuel-oxidizer mixture is ignited. The latter drawback was of no concern in most military applications. Firepower. The most obvious military application of rockets is as vehicles for destructive warheads. The chief advantage here is rapid acceleration without recoil. Rockets could be launched from aircraft or landing craft that could not handle the recoil of conventional artillery of equal destructive power. By the end of the war, Allied aircraft could carry up to ten 5" (127mm) rockets, giving them firepower equal to two broadsides from a destroyer. Rocket-firing fighters were first employed in the European theater and made their debut in the Pacific in the Marshalls campaign. A number of landing craft were modified to carry hundreds of rockets, giving these small craft the ability to lay down a massive bombardment on an invasion beach. However, the aircraft or landing craft then had to return to a munitions ship or a base to reload. In March 1945 the "Tiny Tim" began to make its appearance in the western Pacific. This was a 11.75" rocket designed at the California Institute of Technology that was carried primarily by Marine F4U Corsairs. Originally designed as either a bunker buster or an antishipping standoff weapon, this was 10'3" (3.12 m) long and weighted 1250 lbs (567 kg), and was fashioned out of standard oil well piping with a 500 lb (227 kg) semi-armor-piercing bomb as the warhead. This carried a 148.5 lb (67.3 kg) explosive charge. To avoid damaging the launching aircraft from the back blast, the rocket was fitted with a lanyard that ignited the propellant only after the rocket had dropped some distance below the aircraft. The weapon is credited with sinking one Japanese ship and damaging a second, but was only deployed in small numbers. In June-July 1945 submarine Barb patrolled off Karafuto and Japan with an experimental rocket launcher that allowed her to fire a barrage on coastal installations. For the same reasons, rockets were employed by infantrymen to deliver antitank warheads against tanks and fortifications. The lack of recoil meant that a small team of infantrymen could launch a heavy warhead to a tactically useful range. 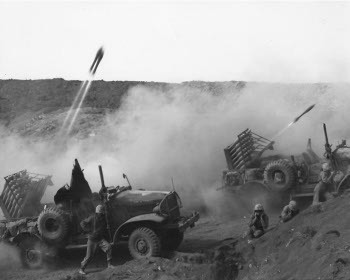 On the other hand, the gas jet from the rocket produced a back blast that gave away the position of the antitank team, endangered other friendly infantry who carelessly positioned themselves close behind the launcher, and prevented safe use from a building or other enclosed space. 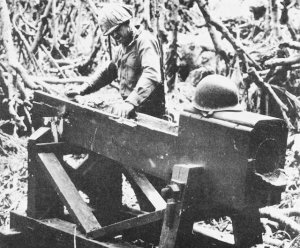 An innovation that first saw service at Saipan was the rocket-firing truck, which could fire a volley of 4.5" (114mm) rockets. 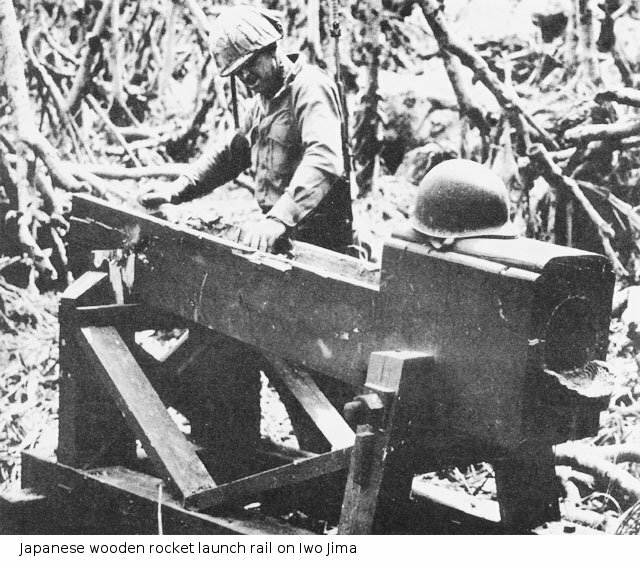 The Japanes also made use of artillery rockets, including 200mm rocket launchers sent to Peleliu just prior to the Allied invasion. This weapon was 43" (109cm) long and carried roughly 130 pounds (60 kg) of a picric acid/flaked TNT mixture. The rocket was propelled by black powder, was launched electrically, and was not very effective, having a high dud rate, no stabilization in flight (which made it wobble like an American football and spoiled its accuracy), and a range of just 1500 yards (1400 meters). Marines on Iwo Jima called it the "bubbly-wubbly" for the blubbering noise it made in flight. Short-Range Aircraft. Both the Germans and the Japanese produced short-range aircraft using rocket propulsion in place of conventional engines. The German Komet was a liquid-fueled interceptor armed with conventional weapons and theoretically capable of successfully landing after its flight. The Japanese Ohka or "Baka bomb" was a solid-fueled suicide aircraft with a large charge of explosives that was carried to within range of its target (a ship) by a conventional bomber. Rocket-Assisted Takeoff. Both the Allies and the Japanese experimented with the use of rockets to assist a heavy conventional aircraft in taking off from a short runway. Rockets were ideal for providing the rapid acceleration needed for just a short time during takeoff. Antiaircraft Weapons. Their ability to deliver a large warhead without recoil makes rockets attractive as antiaircraft weapons. However, the rockets developed during the Second World War lacked any kind of guidance and were not accurate enough to be successful in this role. The Germans armed some of their jet fighters with air-to-air rockets capable of taking down a heavy bomber with a single hit, but getting even a single hit was a remarkable stroke of luck. The Japanese mounted surface-to-air rockets on their warships late in the war, but these are not thought to have destroyed a single Allied aircraft. Effective antiaircraft rockets would have to await postwar advancements in guidance technology before they became effective.